This article gives a practical example of the functionality described in the language documentation about include. The code of this example is kept as simple as possible, focusing on being a guide of correct library usage. All action steps you should follow are in a numbered list. In order to write an example project that everyone can relate to, without using more than the most basic code, we chose a simulation of a work day. Pressing 'play' on your main robot should start the simulated day from a set starting time. Every second, a simulated hour passes. During this 'day', some devices (included as libraries) are used, which means that functions from them are called. The work day ends at a set time. A separate file (or robot) keeps these personal and project properties as a library as well. Main.xill is the root robot. It runs the complete project. The script folder contains all custom project scripts. You should be able to run Main now, even though it does not do anything yet. Like said before, you will set a start- and end time for your work day. You might also need other user properties and/or project properties. A good way to store these in one place is with a new robot called 'Settings.xill'. It should now be clear what the Xill syntax is for using libraries. We'll add some code to the WorkDay robot to actually see it doing something. 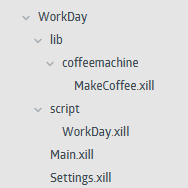 As you can see, the function call workOneDay() was added to the robot, enabling you to run it independently from Main.xill. This makes debugging easier. It is time to add some external libraries. Those are robot files that are not (or as little as possible) project-specific, and often made by a collegue or someone else from the Xill user community. There is no difference in syntax from the includes that we have already done in the previous steps, but these libraries should have their own folder, not in the root or script folder. Connectors are (ideally) also an example of non-project-specific libraries, but since they have quite a special status for Xill, they usually have their own 'connector' folder, next to the 'lib' folder. The lib folder contains project-independent libraries. Connectors are a special case, and should reside in a connector folder. Now you can run your work day from the Main robot. Play around with the settings if you wish. In case you gut stuck somewhere, check out the full project zip file below. If anything about using libraries in Xill is still not clear, feel free to click 'Not helpful' below and tell us.